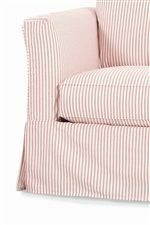 This slipcover glider chair will be a brilliant addition to any room. Accent your living room with the clean and simple lines of this chair. It features flair arms and a fully tailored skirt. It features one additional throw pillow to accent the piece. Designed with extra luxurious sink-in comfort cushions it will feel feather soft when you sit down while the glider mechanism will let your rock with ease. Adorn your home with this beautifully designed chair. The Darby Slipcover Glider Chair by Rowe at Reeds Furniture in the Los Angeles, Thousand Oaks, Simi Valley, Agoura Hills, Woodland Hills, California area. Product availability may vary. Contact us for the most current availability on this product. Welcome the casual style of the Darby collection that will light right at home whether in your country home or seaside getaway. Kick back and east into comfort that this collection has to offer. This collection features a sofa, queen sleeper, love seat, chair, glider chair and ottoman. All of the cushions of made with extra luxurious sink-in comfort for a feather soft feel. The sleeper features a CloudCoil mattress that everyone will want to sleep on. With the fully tailored skirts and flair arms, this collection is sure to bring comfort and style into any home. The Darby collection is a great option if you are looking for Casual furniture in the Los Angeles, Thousand Oaks, Simi Valley, Agoura Hills, Woodland Hills, California area. Track Arm and Fully Tailored Skirt Featured in this Collection. Browse other items in the Darby collection from Reeds Furniture in the Los Angeles, Thousand Oaks, Simi Valley, Agoura Hills, Woodland Hills, California area.